The extensor tendons of the hand are in a relatively superficial position; consequently, they are highly susceptible to injury from lacerations, bites, burns, or blunt trauma. Extensor tendon injuries are commonly diagnosed in the emergency department (ED). Certain injuries can be repaired in the ED,  whereas others should be repaired by a hand surgeon at a later time in an operating room (OR). 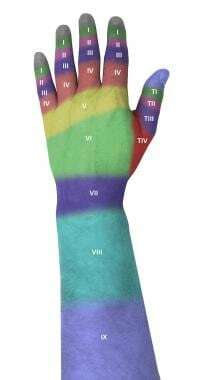 Division of dorsum of hand and forearm into anatomic zones. Treatment of extensor tendon injuries may require operative intervention, depending on the complexity of the injury and the zone of the hand involved. For treatment of injuries to specific zones of the hand, see Technique. The goal of repair is to restore tendon continuity and function, with a secondary goal of allowing early motion of the injured digit. Optimal preparation and technique are critical for minimizing adhesions and scar tissue formation and ensuring the best possible outcome. Extensor tendon injuries are often more difficult to treat than flexor tendon injuries, owing to several issues specific to extensor tendons. The extensor mechanisms of the hand are in a superficial position, not enclosed in tendon sheaths (as flexor tendons are), and often have limited retraction after injury. Extensor tendons also tend to be thinner and flatter than flexor tendons are, as well as being in very close proximity to bony structures. This leaves them highly susceptible to adhesions and shortening, which can severely impair function and range of motion. In these cases, the repair should be performed by an experienced hand surgeon, preferably in the OR. Several anatomic structures contribute to the extensor mechanism, including the extrinsic muscles of the forearm, intrinsic muscles such as the interosseous and lumbricals, and fibrous structures. The extrinsic tendons pass through the extensor retinaculum on the dorsum of the wrist. This structure is divided into six compartments, each of which has tendons that pass through. The third compartment is of particular importance in injury patterns. Injuries to the distal radius can result in rupture of the extensor pollicis longus (EPL), which passes through this compartment. Of significance, the sixth compartment contains the extensor carpi ulnaris (ECU), which serves as a major stabilizer for the distal radioulnar joint (DRUJ) as well as extends the wrist. 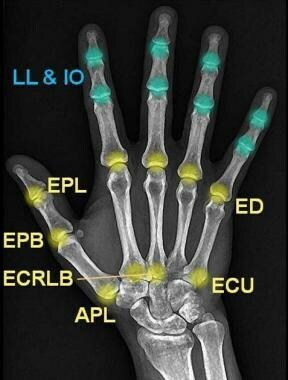 [4, 6] Also significant anatomically is the presence of the extensor indicis proprius (EIP) and the extensor digiti minimi or quinti (EDM or EDQ), which extend the index and small fingers, respectively. The extensor apparatus of the triphalangeal digits has three separate insertion sites and is formed through a complex interplay of the extrinsic extensors, the intrinsic extensors, the and digital ligaments. Proximally, it is attached at the level of the metacarpal heads by a sagittal band, which centers the tendon and prevents hyperextension. The most important insertion site is the insertion of the central slip at the base of the middle phalanx to extend the PIP joint. There is a third insertion point distally to extend the DIP joint, comprising the conjoined lateral bands. Extensor tendon insertion sites. LL = musculi lumbricales; IO = musculi interossei; EPL = musculus extensor pollicis longus; EPB = musculus extensor pollicis brevis; ED = musculus extensor digitorum communis; ECRLB = musculus extensor carpi radialis longus et brevis; ECU = musculus extensor carpi ulnaris; APL = musculus abductor pollicis longus. Extrinsic muscles are colored in yellow, intrinsic muscles in blue. Image courtesy of Dr Roberto Schubert, Radiopaedia.org, http://radiopaedia.org/cases/flexor-and-extensor-insertions-at-the-hand-and-wrist. For more information about the relevant anatomy, see Hand Anatomy and Wrist Joint Anatomy. Calabro JJ, Hoidal CR, Susini LM. Extensor tendon repair in the emergency department. J Emerg Med. 1986. 4(3):217-25. [Medline]. Kleinert HE, Verdan C. Report of the Committee on Tendon Injuries (International Federation of Societies for Surgery of the Hand). J Hand Surg [Am]. 1983 Sep. 8(5 Pt 2):794-8. [Medline]. Sameem M, Wood T, Ignacy T, Thoma A, Strumas N. A systematic review of rehabilitation protocols after surgical repair of the extensor tendons in zones V-VIII of the hand. J Hand Ther. 2011 Oct-Dec. 24(4):365-72; quiz 373. [Medline]. Megerle K , Germann G. Extensor tendon injuries. Neligan PC, ed. Plastic Surgery. 3rd ed. Philadelphia: Elsevier Saunders; 2013. 210-27. Hanz KR, Saint-Cyr M, Semmler MJ, Rohrich RJ. Extensor tendon injuries: acute management and secondary reconstruction. Plast Reconstr Surg. 2008 Mar. 121(3):109e-120e. [Medline]. Griffin M, Hindocha S, Jordan D, Saleh M, Khan W. Management of extensor tendon injuries. Open Orthop J. 2012. 6:36-42. [Medline]. [Full Text]. Davenport M. Injuries to the arm, hand, fingertip, and nail. Tintinalli JE, Sapczynski JS, Cline DM, Ma OJ, Cydulka RK, Meckler GD, eds. Tintinalli's Emergency Medicine. 7th ed. New York: McGraw-Hill; 2011. Vol 1: 47. Monaco NA, Dwyer CL, Ferikes AJ, Lubahn JD. Hand Surgeon Reporting of Tendon Rupture Following Distal Radius Volar Plating. Hand (N Y). 2016 Sep. 11 (3):278-286. [Medline]. Murphy HA, Jain VV, Parikh SN, Wall EJ, Cornwall R, Mehlman CT. Extensor Tendon Injury Associated With Dorsal Entry Flexible Nailing of Radial Shaft Fractures in Children: A Report of 5 New Cases and Review of the Literature. J Pediatr Orthop. 2016 Nov 7. [Medline]. Hart RG, Uehara DT, Wagner MJ. Emergency and Primary Care of the Hand. Irving, TX: American College of Emergency Physicians; 2001. 175-88. Tang JB. Tendon injuries across the world: treatment. Injury. 2006 Nov. 37(11):1036-42. [Medline]. Lalonde D, Bell M, Benoit P, Sparkes G, Denkler K, Chang P. A multicenter prospective study of 3,110 consecutive cases of elective epinephrine use in the fingers and hand: the Dalhousie Project clinical phase. J Hand Surg Am. 2005 Sep. 30(5):1061-7. [Medline]. Lalonde DH. Wide-awake flexor tendon repair. Plast Reconstr Surg. 2009 Feb. 123(2):623-5. [Medline]. Bezuhly M, Sparkes GL, Higgins A, Neumeister MW, Lalonde DH. Immediate thumb extension following extensor indicis proprius-to-extensor pollicis longus tendon transfer using the wide-awake approach. Plast Reconstr Surg. 2007 Apr 15. 119(5):1507-12. [Medline]. Kostopoulos E, Casoli V, Verolino P, Papadopoulos O. Arterial blood supply of the extensor apparatus of the long fingers. Plast Reconstr Surg. 2006 Jun. 117(7):2310-8; discussion 2319. [Medline]. Newport ML, Tucker RL. New perspectives on extensor tendon repair and implications for rehabilitation. J Hand Ther. 2005 Apr-Jun. 18(2):175-81. [Medline]. Hart RG, Uehara DT, Kutz JE. Extensor tendon injuries of the hand. Emerg Med Clin North Am. 1993 Aug. 11(3):637-49. [Medline]. Hammond K, Starr H, Katz D, Seiler J. Effect of aftercare regimen with extensor tendon repair: a systematic review of the literature. J Surg Orthop Adv. 2012 Winter. 21(4):246-52. [Medline]. Neuhaus V, Wong G, Russo KE, Mudgal CS. Dynamic splinting with early motion following zone IV/V and TI to TIII extensor tendon repairs. J Hand Surg Am. 2012 May. 37(5):933-7. [Medline]. Dy CJ, Rosenblatt L, Lee SK. Current methods and biomechanics of extensor tendon repairs. Hand Clin. 2013 May. 29(2):261-8. [Medline]. Altobelli GG, Conneely S, Haufler C, Walsh M, Ruchelsman DE. Outcomes of digital zone IV and V and thumb zone TI to TIV extensor tendon repairs using a running interlocking horizontal mattress technique. J Hand Surg Am. 2013 Jun. 38(6):1079-83. [Medline]. Feuvrier D, Loisel F, Pauchot J, Obert L. Emergency repair of extensor tendon central slip defects with Oberlin's bypass technique: feasibility and results in 4 cases with more than 5 years of follow-up. Chir Main. 2014 Oct. 33(5):315-9. [Medline]. Fitoussi F, Badina A, Ilhareborde B, Morel E, Ear R, Penneçot GF. Extensor tendon injuries in children. J Pediatr Orthop. 2007 Dec. 27(8):863-6. [Medline]. Povidone-iodine solution, 1% lidocaine, 10-mL syringe, and 25-gauge needle. Suture techniques for tendon repair. Video clip of splint application. The authors and editors of Medscape Drugs & Diseases gratefully acknowledge the assistance of Lars J Grimm, MD, MHS, with the literature review and referencing for this article. Fast Five Quiz: Are You Prepared to Confront Holiday Decorating Injuries?